Weather may affect the mood of people. 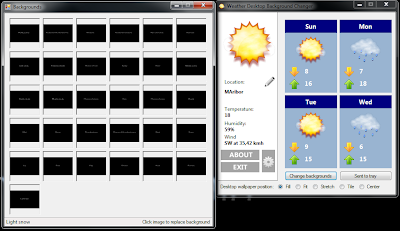 If you want to know the weather outside the office even your working at your desk then try Weather Desktop Background software which can change your wallpaper based on the Weather conditions. Just download this portable application and unpack it on your system. Right away you can run it. Select your location in the world and then specify the desktop background images for each weather condition. By default, weather conditions display is in text only. Weather Desktop Background will work on Windows 7 operating system only.